Accolades for Pinckleys & Ship of Life	Our best wishes to Paul and Debbie Pinckley as they leave us after 3 years of loving service on the Ship of Life. Phnom Penh Post - Saving Tonle Sap school kids from drowning	Saving Tonle Sap school kids from drowning After spending many weeks working in ten villages of Kampong Kleang Commune, north of Siem Reap on the edge of Tonle Sap Lake, NGO Partners in Progress learned that villagers’ most pressing need was to protect their children from drowning while travelling to school by boat. Life Vests For Kompong Khleang Village	Many children die each year on their way to school when their little Row Boats capsize. 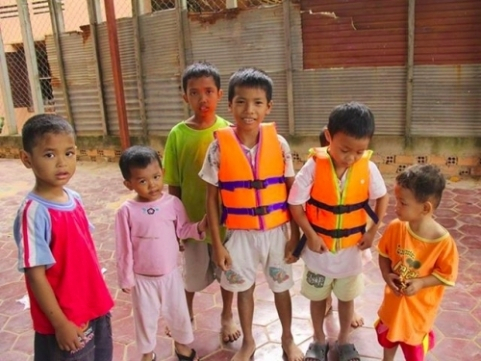 We are tryng to buy 1500 life vests to help those in Kompong Khleag village where weare planting a new church. $5 buys one like these boys are modeling for you. Can youhelp? P.O. Box 13989, Maumelle, AR 72113. Share this and help us raise the money to save these kids. You may also use the "Make A Donation" button on the home page. Many children die each year on their way to school when their little Row Boats capsize. We are tryng to buy 1500 life vests to help those in Kompong Khleag village where weare planting a new church. $5 buys one like these boys are modeling for you. Can youhelp? P.O. Box 13989, Maumelle, AR 72113.
the "Make A Donation" button on the home page.